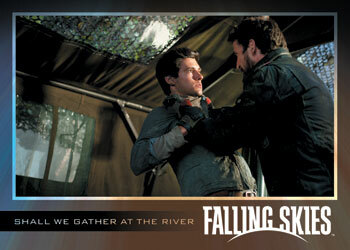 Keeping in line with the first season's set, 2013 Rittenhouse Falling Skies Season 2 trading cards use a premium pack format. It translates into an autograph and two relic cards in every pack. 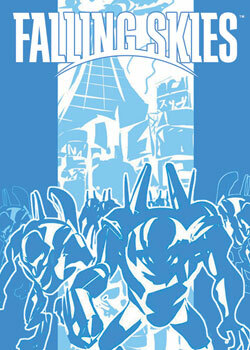 The release also includes a small base set and a pair of basic insert sets. A total of 30 base cards cover the ten episodes of the second season. 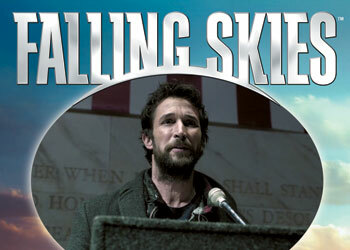 Every 2013 Rittenhouse Falling Skies Season 2 pack has three of them. Autographs cover a mix of lead stars and notable guest stars. Among the confirmed signers are Noah Wyle (Tom Mason), Moon Bloodgood (Anne Glass), Will Patton (Captain Weaver) and Terry O'Quinn (Arthur Manchester). All Relic Cards come with swatches of show-worn costumes. Each is also serial numbered. Landing a pair per pack, costumes come from top actors including Wyle, Bloodgood, Connor Jessup, O'Quinn, Sarah Carter and Drew Roy. Each pack also has one basic insert from one of two sets. Both the Quotable and International Poster Art sets have nine different cards. Each are produced in the same quantities. Those ordering two boxes receive a Will Patton autographed relic. 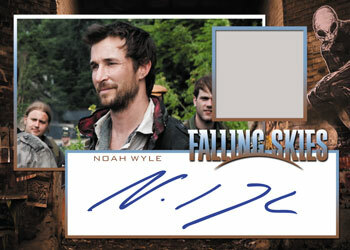 The four-box incentive is a Noah Wyle autographed relic. 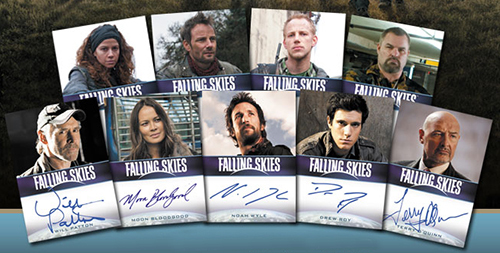 Archive Boxes featuring all pack-inserted cards and the incentives are available to those ordering eight 2013 Rittenhouse Falling Skies Season 2 boxes. 2013 Falling Skies Season 2 MELISSA KRAMER On Card Autograph "Sarah"
Inserted one per pack. All are limited to 200 copies or less. 9 cards. Inserted 1:2 packs. 19 cards. Inserted two per pack. Numbering continues from where Season 1 left off. BT1 "Get Off My Planet"
Good: Strong focus on show's leads, cuts to the chase while maintaining reasonable prices, nice continuity from Season 1 set. Bad: Limited appeal for those not familiar with the show. The Bottom Line: Rittenhouse continues to impress with its premium pack products that target smaller niche audiences. 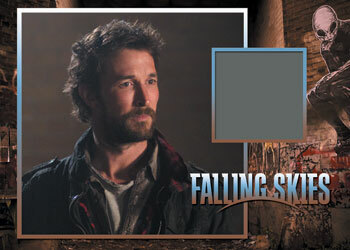 Falling Skies Season 2 is hits-heavy with two costume cards and an autograph in every pack, but prices are very reasonable all things considered. The main actors are well represented throughout the set, however some of those names may be difficult to recognize for people who don't watch Falling Skies. But they're not the target. Without a lot of products dedicated to the show on the market, this is a set aimed squarely at its fans. While all the cards in 2013 Rittenhouse Falling Skies Season 2 look solid, the autograph and costume cards are definitely the standouts. Autographs have on-card signatures and a balanced look that includes a good-sized character shot, ample signing space and key art with the show's logo. It's a format Rittenhouse uses often ad they use it well. Costume cards get the balance right again. It starts with a swatch that's big enough to be meaningful. The blocked elements of the image and background work nicely. One of the small things that makes a big difference is a photo of the full piece of costume that it came from on the back. It would have been nice if the base cards used a little more image and less borders. The show itself doesn't seem to use a lot of bright colors. Combine that with a dark border and there's not much pop. But even that's not a huge deal. I appreciate that every episode is represented without going overboard. You can look at the checklist in one of two ways. If you're a fan of the show (which is probably why you'd be buying it), it couldn't get much better. The lead stars like Noah Wyle and Moon Bloodgood both have autographs and relic cards. Every episode is captured and there are some other inserts that look at other corners of the show. But what about appeal outside the show's fan base? There's really not much. Wyle hit it big on E.R. 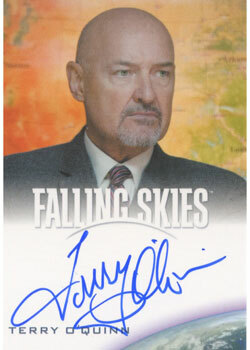 and a lot of collectors likely remember Terry O'Quinn from LOST. Some could look at it as a prospecting venture where some of the actors will eventually move onto bigger things. 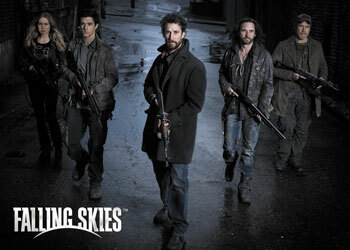 But by the very nature of the set, 2013 Rittenhouse Falling Skies Season 2 is going to be appreciated by those who like the show. And there's nothing wrong with that. It's just less likely that people are going to want to casually dabble in it. But even then, the extremely small production and higher price point are likely to limit those types of purchases anyhow. At $40-50 per pack, there's a very different feel about these sorts of premium packs. Until you think of them essentially as a traditional box minus 98% of the base cards. Then it actually turns out to be a fairly solid value considering there are two costume cards, an autograph and a handful of other cards. Toss in the limited production and you've got something that's extremely reasonable. On the one hand, I love busting a full box and then looking over all the cards and sorting them. It's like a night's worth of entertainment. By their very nature, these premium packs can't do that. With these packs, all the busting, scouring and sorting takes up all of five minutes. But traditional boxes often come with lots of doubles and even some cards that you might not want. It becomes an issue of space and storage. Premium packs don't have that issue. It's compact, covers the bases and doesn't throw your organization out of whack. 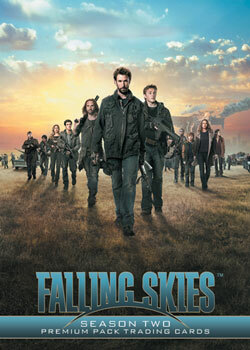 As mentioned, this is a set for fans of Falling Skies. Those that are should be able to connect with every angle of the set. Those that haven't seen the show before, I'd recommend the DVD first. If your going to do these ultra high priced series I wish you would do a better job of making it obvious that these are expensive, holy crap.